Deutsche Bank's new 2013 global solar installation number of 40,000 megawatts is eye-popping. It will provide actual electricity production equal to 8 new nukes, assuming each nuke is about 800 megawatts and has a capacity factor of more than 90%. The US has a nuclear fleet of 103 units that represent a bit less than 25% of the world's nuclear plants. The annual global solar market is already enormous and is still growing rapidly. Within 10 years the world likely will be building each year an amount of solar that is the equivalent of approximately 25 new nuclear plants. That is a global energy game changer! Exxon held its annual shareholder meeting, where the Board of Directors recommended a vote against a shareholder resolution that called for the company to address the risks created by climate change. The resolution was defeated but drew 27% support from Exxon's shareholders--a significant number of dissenting shareholders. "I think our views on climate change and the risk of climate change have been fairly well described both in public forums where I and others have spoken as well, as in publications in the ways we have expressed review climate change as a serious issue, it does present serious risk. I will maintain the view that I have had for some time now, but notwithstanding all the advancements that have been made in gathering more data, instrumenting the planet so that we understand how climate conditions on the planet are changing, notwithstanding all that data, our ability to project with any degree of certainty the future is continuing to be very limited." The good news is that Tillerson says climate change presents a "serious risk." The continuing unfortunate news is that Exxon favors effectively business as usual, despite the admitted serious risk posed by a warming climate. And despite the fact that atmospheric carbon concentrations are now at 400 ppm, the highest level in 3 million years, and that temperatures, sea levels, ocean acidity, and moisture content in the air are already up. Tillerson's defense of a business as usual course is uncertainty about the amount of warming. Indeed, there are degrees of uncertainty about what the next 87 years of this century will bring in climate, but science has provided ranges of impacts that have a high degree of probability. In its business, Exxon is a big enough that it may normally self-insure against many risks. The people, flora, and fauna already impacted by climate change cannot do the same now and will not be able to do so as the impacts become more disruptive, destructive, and expensive. A great way to lose money had been to invest in solar stocks. At least that was the case from 2009 to 2012. But leading solar stocks are roaring back in 2013. The winners include solar panel manufacturers, where brutal competition had destroyed profit margins. First Solar, America's leading solar manufacturer, is up 270%. Sun Power, another US solar manufacturer, is up 240%. Not so surprisingly, Solar City, a solar installer, has soared too. Two trends in the solar market are behind the strongly rebounding solar stocks. Consolidation in solar manufacturing has begun. One company's bankruptcy is another company's opportunity. Yet, global manufacturing capacity still exceeds global demand, and competition remains intense. Though consolidation is helping stock prices, the main factor pushing up solar stocks is booming global solar demand. Deutsche Bank has just boosted yet again its 2013 projection for global solar installations to an astonishing 40,000 megawatts. Japan will be the leading market this year at 7,000 to 8,000 megawatts. Strong growth will be seen in China and America as well. When the world is literally going solar, the opportunity to make money in the solar business has never been brighter. Ten years ago, when the nation was getting ready to build more than 150 new coal-fired power plants, the idea of a state passing legislation that closed coal plants and replaced them with natural gas and renwables would have been truly laughable. Times change and quickly. The Nevada state senate just passed--unanimously--a bill that requires the closure of 800 megawatts of cal generation and its replacement by 550 megawatts of natural gas and 350 megawatts of renewable energy capacity. The state's biggest utility, its GOP Governor, and Harry Reid all supported it. As this bill shows, Nevada is also one of the majority of states that still has legislatures and public utility commissions decide what kind of generation is built in a state. Political choice, not market choices, still substantially dictates what generation gets built in America. Across America, natural gas and renewable energy is now providing 100% of the nation's new electric generation capacity. And Warren Buffet, who is one of the nation's biggest investors in wind and solar generation, likes the trend. Indeed, yesterday Buffet bought Nevada Energy, a utility serving Las Vegas, for $5.6 billion, and I suspect Buffet viewed the move toward more renewable generation in Nevada as a reason to make the purchase. In the minds of many, solar still is expensive, fringe. Time to think again. In 102 nations, solar systems provide power at prices lower than taking power from the national grid. In the US, solar is now at grid parity in about 15% of the nation's utility service territories. The solar revolution is global and its explosive growth is rooted firmly in the sound foundation of falling costs. Indeed, solar has reached the tipping point of providing power at lower prices than the grid in about half the world. Truly amazing! Today, I released my 8-point Strategic Jobs Plan that creates 382,750 jobs, adds $8 billion of revenue per year, and eliminates $931 million per year of waste in Pennsylvania. It is just 8 easy pages of reading. I am the first and so far only candidate for Governor with a jobs plan. The plan includes building a statewide network of alternative fueling stations for electric and natural gas vehicles so that consumers could cut their fuel bill by $1,000 to $2,000 per year. A governor creates jobs with smart policy, and a governor who does not master policy will fail. In and out of government, I have spent 29 years developing and implementing policy and will implement this 8-point Strategic Jobs Plan if elected governor. The leading source of carbon emissions in the United States is oil combustion and by quite a bit. In fact, burning oil accounts for about 30% more carbon emissions than the next leading source which is coal. Yet, carbon emissions from coal, natural gas, and oil headed in different directions in the first 2 months of 2013. Emissions from oil are down again and significantly, but emissions from oil and gas are up. What does that rising and falling add up to? US carbon emissions in the first two months of 2013 are up 1.5% compared to the same period in 2012.
http://www.eia.gov/totalenergy/data/monthly/pdf/mer.pdf. See Section 12 of the May Report. While emissions from coal and gas rose in January and February, emissions from oil declined 2%. Despite the falling emissions from oil, the increases in emissions from coal and gas were substantial enough to raise total emissions. Why did emissions from coal and natural gas increase in the first two months? More coal was used to generate power and more gas was used to heat buildings, as this year's winter was a bit colder than the record warm temperatures of 2012. Emissions from oil fell, as a result of greater fuel efficiency in vehicles and continuing movement to oil substitutes like electricity, gas, and biofuels. The continuing decline in emissions from oil--the leading source of US carbon emissions--is a bright spot in the 2013 carbon data that probably will see a rise in total carbon emissions primarily as a result of a significant increase in the use of coal to make electricity. One reason that coal-fired power plants are having a good run in 2013 is rising natural gas prices, but a second factor boosting coal generation is the continuing drop in output from nuclear plants. In the first two months of 2013, nuclear output fell 2.5% compared to the same period in 2012 and 3.5% from 2011 levels. In January and February 2013, nuclear plants cumulatively generated 132.8 billion kilowatt-hours and operated at a 92.3% capacity factor. Those numbers dropped from 137.5 billion kilowatt-hours and a 96% capacity factor in 2011. The drop in production reflects continuing plant struggles in California and Florida but do not include the recent retirement of a nuclear plant in Wisconsin. In short, the full 2013 is shaping up to be a not good one for the nation's nuclear fleet. Does gas drilling reduce or increase the value of nearby homes? It's a deceptively simple question. Done by Duke University and Resources For the Future, a study of 19,000 properties in Washington County, Pennsylvania from 2004-2009 provides data that thrill and annoy all sides of the fracking wars. Indeed, it is a big "unless." The researchers find that gas drilling gives and takes. The winners include those homeowners who have a water utility provide their water. The property values of homes supplied by water lines go up 10.4% after gas drilling. The losers include homeowners who rely on private water wells who see their property values drop 23.6%. Hopefully, Duke or other researchers do more studies on the impact of gas drilling on property values in more places in Pennsylvania and outside it. The single study is interesting but limited by its focus on just Washington County and sales that took place more than 4 years ago. This study, however, reminds one more time of a fundamental truth about gas drilling and all energy development--it creates both winners and losers. This fact is why every state but Pennsylvania has enacted a gas drilling tax in order to create widespread benefits for all citizens of a state that host gas production. Sales of plug-in hybrids in the USA have just pushed past the 100,000 vehicle milestone. http://www.greencarreports.com/news/1084252_100000th-plug-in-electric-car-in-u-s-sold-today-more-or-less. Indeed, Plug-In America's sales counter puts the number at 101,686, as of this morning. While it took a bit more than 2 years for sales to cross the 100,000 mark, 2013 alone could see another 100,000 plug-ins sold in America. Increasing sales are a function of more choices, better cars, lower prices, more charging stations, and sustained gasoline prices above $3 per gallon. Even more than price, limited range and few public charging stations remain the electric vehicles primary obstacles. But progress is being made on both fronts. The latest Nissan Leaf has increased its range to 124 miles and new public charging stations are being built especially in several Western states. Competition works in the electricity generation industry. And competition is driving way down the prices for health insurance on the Insurance Exchanges established in California and Oregon. Before President Obama embraced competition through insurance exchanges, the purchase mandate, and "premium support" for low-income buyers, many conservatives embraced those ideas and pushed for health reform similar to what California and Oregon are now doing. If competition for private insurance pushes prices down 50% below what was expected, does it really matter that President Obama is a supporter of the ideas that produced that result? It is too early to tell whether or not the Affordable Health Care Act will work. Real doubts exist. But perhaps these ideas will work and command broad support once again. Unlike California and Oregon, Governor Corbett refused to establish competitive insurance exchanges in Pennsylvania and instead left that job to the federal government to do it for us. Terrible decision. It's a good thing for Delaware and Idaho that they have powerful neighbors that export power or their lights would be out more than on. Delaware and Idaho generate less than 50% of the electricity that they consume. See page 31 at: http://www.nrdc.org/air/pollution/benchmarking/files/benchmarking-2013.pdf. The rest of the top 10 top electricity importers begins with Virginia in the third spot, Maryland, California, Tennessee, New Jersey, Massachusetts, South Dakota, and then Minnesota. For the residents of these top ten electricity importing states, it is good to be an American, and they should thank the founders for the Interstate Commerce Clause of the United States Constitution. Distant power plants located in other states and the interstate movement of electricity keep the lights on in the top 10 electricity importing states. Question Of The Day: Is Frequency Of Strong Tornadoes Up, Down, Or Stable Since 2000? Is the frequency of strong tornadoes up, down, or stable during recent years? Down is the answer. In the 58 years from 1954 to 2012, there have been 20 years that have had 50 or more F3 or stronger tornados. But from 2000 to 2012, there were just 2 years with 50 or more F3 tornados. As a result, from 1954 to 2000, 50 or more F3 tornados in a single year hit every 2.5 years. Yet, since 2000, the frequency of a year with more than 50 F3 tornados has fallen to once every 6 years. 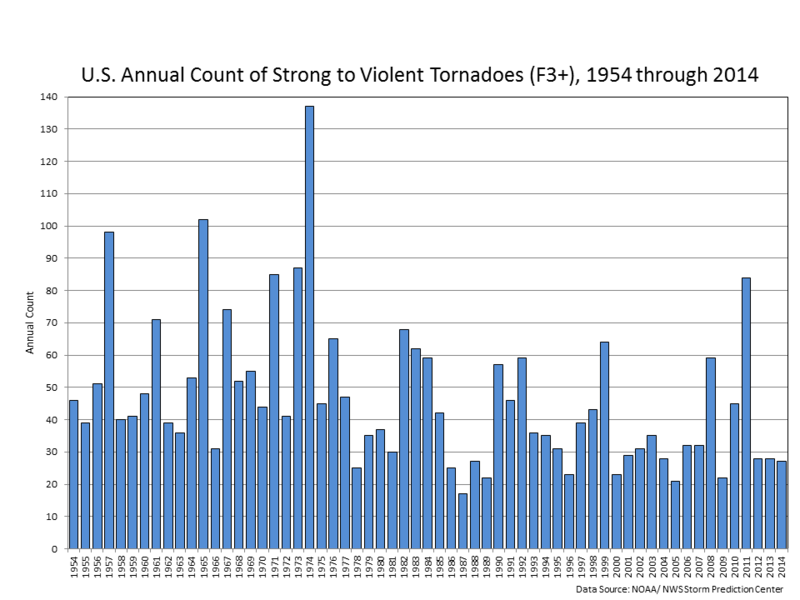 The worst year for strong tornados was 1970 with 130, followed by 1965, and 1957--the year of my birth. Coal-fired generation recovered strongly in the first quarter of 2013, when it provided 40% of America's power generation. Coal's gain came at the expense of natural gas that saw its market share drop from 30% for all of 2012 to 25% in the first quarter of 2013. If natural gas prices move this year to $5 per thousand cubic feet, as some predict, coal's recovery will gain more steam in the months ahead. Here are some facts that I am sure will never air on fair and balanced Fox News. The Tesla $465 million loan that yesterday was repaid 9 years early is one of 30 loans made by the Department of Energy in a program to foster energy innovation. Another one of the 30 loans was to Solyndra that had an innovative cylindrical solar panel design. The loans to Tesla and Solyndra create a question: does the successful Tesla or the bad Solyndra loan best represent the performance of the Department of Energy $34-billion-30 loan portfolio? Solyndra is the exception of default to the rule of good performance among the $34-billion-30-loan portfolio. Indeed, DOE states that losses to date represent just 2% of the $34 billion portfolio, with the other 98% being repaid. And Congress expected losses in this program to foster innovation, when it authorized and funded it during the George W. Bush Administration. Yes, you can give credit to President Bush, if you want, for launching a successful program, though the Obama Administration has administered nearly all the loans made under it. Congress funded a loan loss reserve for this program, as it realized its purpose was to finance innovative but risky energy ventures. At this point, 90% of the funds set aside to pay for loans that defaulted remain unused. In short, this DOE loan program will cost the taxpayers considerably less than was expected and it is delivering large benefits. The loan portfolio includes not just Tesla and its enormous repaid success but also 19 clean energy power plants that are producing enough power for 1 million homes, with little or no air or water pollution. The real facts about the performance of the 30-loan portfolio that includes both Tesla and Solyndra show big benefits to taxpayers at much less cost than was budgeted. Just don't expect to see or hear any of these real facts on Fox, the Wall Street Journal editorial page, Hannity, Limbaugh, and the rest of right wing media. The right wing ideological bubble strengthens daily and so loses touch with America a bit more each day. "A major new report on U.S. power plant emissions from the top 100 power producers shows that the electric industry cut emissions of NOx, SO2 and CO2 in 2011 even as overall electricity generation increased, largely due to increased use of natural gas and growing reliance on renewable energy." At the 100 largest electricity generation companies, nitrogen oxide pollution and sulfur dioxide pollution is down 70% and 72% respectively from 1990 to 2011. Mercury emissions are down 40% since 2000. From the 100 largest electricity generation companies, carbon dioxide emissions are up 20% since 1990 but down 7% from 2008 to 2011. Their carbon emissions significantly fell again in 2012 but this report does not include last year. Thank you to NRDC and Ceres for this feast of positive environmental and pollution facts and trends! A new report from NRDC and Ceres finds that gas and renewable generation boomed together, while electricity produced from coal fell significantly between 2000 to 2011--the Age of Shale Gas. From 2000 to 2011 NRDC and Ceres calculate that natural gas generation rose 69% and renewable energy 44%. Unlike gas and renewables, coal saw a 12% decline in electricity produced during this period. It will surprise nobody that the Age of Shale Gas led to substantially higher natural gas electricity fired generation. But it may still surprise many that renewable energy generation skyrocketed too. Moreover, the rise from 2000 to 2011 in renewable energy would have been much greater, if the analysis had looked at just wind and solar. The booms in wind and solar were extraordinary during this period, and the 44% increase found in the study for "renewable energy" reflects much slower growth in hydro, biomass, and geothermal over the period. Southern Company continues to press its generation monopoly to the limits but just might have gone beyond the breaking point even in Mississippi. Southern's 582-megawatt, coal gasification Kemper plant, that was budgeted to cost a very large $2.4 billion, now is running a gargantuan $4.2 billion or $7 per watt. Though the plant is not running and won't until 2014 at the earliest, the captured monopoly ratepayers of Southern in Mississippi have been and are paying for the plant. 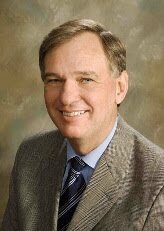 The latest cost overrun at Southern brings to mind the many lectures by Southern's Chief Executive about his belief in the superiority of the traditional monopoly generation system to electricity generation competition practiced in Pennsylvania and some other states. In Pennsylvania, the power plant builders own all a plant's profits or losses and earn no revenue from consumers, unless and until they actually produce a kilowatt-hour. If that alignment of incentives sounds better to you, you are right that it is. And by the way, Southern is building two nuclear plants in Georgia that are behind schedule and over budget. Southern's Georgia captive ratepayers are also paying today for those to-be-built nuclear plants. It's good to be the monopolist. Last week's poll from the University of Michigan and Muhlenberg College showing 58% support for a moratorium on gas drilling in Pennsylvania was quickly dismissed by the gas industry, as I expected. Indeed, the wording of the question about a moratorium did have some problems. But the poll asked another well-worded question about support for gas drilling in Pennsylvania. That question found 49% support it, and 40% do not. In short, gas drilling no longer has majority support in Pennsylvania. And the 9-point plurality in favor of gas drilling in Pennsylvania is not much different from the narrow margins in New York. The Michigan-Mullenberg poll also found those strongly supporting and opposing the industry are almost equal in size at about 20% to 25%. Another approximately 55% of Pennsylvanians neither strongly support or oppose the industry. And in this big middle group, trends should worry the gas industry. While the gas industry continues to say nothing is amiss with public opinion, its operations, and its taxation, the Michigan-Mullenberg poll indicates strongly otherwise. What has pushed public support for gas drilling below 50% and increased opposition to 40%? Four major causes exist. First, too many accidents like last week's compressor station and fire in Susquehanna county. Last week's compressor fire was neither the first in Susquehanna County nor in Pennsylvania. Too many accidents and spills erode public support for gas drilling and also contribute to an implosion in public confidence about the Corbett Administration's oversight of the gas industry. While poor or mediocre industry performance makes gas regulation tougher, the Corbett Administration from the outset chose to fight citizens concerned about gas drilling and to adamantly oppose any gas drilling tax. It has also not hired any more gas inspectors, cut violations issued to the gas industry by 50%, and picked one fight after another with the Environmental Protection Agency, even describing the EPA as a "rogue" agency. Bashing the EPA thrills the 25% of Pennsylvanians that are the drill-baby-drill group but chills the much bigger segment that wants the gas industry strongly and professionally regulated. To make matters even more toxic, many people view the Governor's opposition to taxing the industry as repayment for large donations by some in the gas industry going back to Corbett's campaigns for Attorney General. Other than Pennsylvania, oil and gas states realize that hosting gas production brings impacts and creates both winners and losers. And so Texas, Wyoming, Alaska, North Dakota--to name a few--all have something in common. They tax energy heavily and, in the case of Texas and Wyoming, even have no income tax. Everywhere but Pennsylvania, oil and gas drilling tax revenues are used to keep college tuition low, fund individual payments in Alaska, or otherwise provide services that benefit all citizens. No tax, inadequate regulation, and too many accidents all add up to public support for gas production below 50% in Pennsylvania. The wind production tax credit has both critics and defenders, because it works. It actually triggers substantial production of wind turbines, installation of huge amounts of new wind power around the country, and tens of thousands of jobs. All that wind generation puts real downward pressure on wholesale electricity market prices in many parts of America that benefits consumers but reduces operating margins for other power plants. The latest example of the power of the wind production tax credit is the booming business at GE's wind turbine business. Following the January 2013 extension of the tax credit, GE received a rush of orders. To be precise, orders for 1,000 megawatts of the latest GE wind turbine were made after the extension. GE's latest turbine is better than ever, generating 6% more electricity, operating better in low wind speeds, and with short term energy storage capability. That adds up to lower costs per kilowatt-hour generated. GE has a backlog of orders for its turbines that get better and better every year. The wind production tax credit produces more wind power, jobs, and better turbines that are driving down further the cost of making electricity from the wind. Wind power now produces about 4% of America's electricity. The wind production tax credit continues to drive innovation, lower costs, and lots of new zero pollution wind power. It works. Laura Legere is a good reporter. Her Sunday, May 19th article is full of important facts. Legere is also a persistent reporter, with good lawyers backing her up. Legere requested access to Pennsylvania Department of Environmental Protection drilling investigative determination letters in 2011, but the Corbett Administration denied the Right To Know Request. The Pennsylvania courts ruled that the Corbett Administration stonewalling was a violation of the public's right to know. Any wonder the public has lost total confidence in the Corbett Administration's regulation of the gas industry? After reviewing the material won in court, Legere writes that 161 water supplies in Pennsylvania have been impacted by gas drilling from 2008 to 2012 and that 103 water supplies were damaged from 2010 to 2012. The number of cases that involved damaged water supplies--83 cases--is less than the total number of water wells affected. DEP provided documentation of gas drilling impacting water supplies going back to 1987. The impacts include loss of water, methane contamination, sediment, and frack water spills from the surface. Methane migration is the leading cause of damage, impacting 90 water water wells. Some cases of damage or water loss were temporary. In other cases, new water wells were drilled or major payments were made by gas drilling companies to impacted property owners. Over the last 5 years, DEP has confirmed an annual average of about 16 cases of gas drilling impacting 32 water wells in Pennsylvania. Interestingly, DEP found considerably more cases of gas drilling impacting water wells in 2008 and 2009, when many fewer wells were drilled, than in 2011 and 2012. What explains the decline in confirmed cases of gas drilling impacting water wells, even as the number of gas wells increased? Probably both the Corbett Administration taking office in January 2011 and making clear that it wanted enforcement of gas drilling regulations changed as well as improvement by some companies in their drilling practices. Water, air, and other challenges demonstrate that more regulatory staff and stronger oversight is needed. Increasing the DEP gas drilling oversight staff by 50% is overdue and so is naming a Secretary for the Pennsylvania Department of Environmental Protection. The Stock Market Falls In Love With Tesla & Solar City: What Does It Mean? When it comes to solar and electric vehicle stocks, bears and shorts have been right. Until the last 6 months. And until especially Tesla and Solar City. Both stocks have skyrocketed by 100% to 300% and brought recently a lot of pain to short sellers. Though the recent explosion in the stock prices of Tesla and Solar City have not ended bearish views about their future (see below), the run up in their stock prices reflects the correct view that the first companies that master solar installation or building an electric car with range will make fortunes. The US solar industry will install 4,000 megawatts or more this year. That market already alone is worth more than $12 billion per year that is wide open for a company or several that could be the equivalent of Home Depot for solar installation--national in scope, large in volume, and low in price. As for electric cars, the sky is the limit for the first company able to produce a successful mass market electric vehicle. Tesla is selling now into a luxury niche, and that alone may be enough to insure a long corporate life. See Rolls Royce, Ferrari, and other great, luxury brand names of the automotive world. But the real prize in electric vehicles is to be first to market with a mass market electric vehicle. Will Tesla be able to drive down its cost and drive up even further its already attractive range? Some stock buyers believe Elon Musk is the man to get that job done. Indeed, Musk is powering Tesla and SolarCity stock prices, as many investors are betting on him! April was a very good month for new natural gas power plants. Across America, 1,224 megawatts of new natural gas power plants came on line, accounting for more than 90% of the new capacity added in April. Natural gas and renewable energy have provided all of the 3,481 megawatts of new power plants that have come on line to date in America from January to April. Of that total, gas plants provided 1,565 megawatts; wind 958 megawatts; solar 845 megawatts; hydro 71 megawatts; and biomass 49 megawatts. Renewable energy cumulatively was 55% of the new capacity added to date this year. No new coal, oil or nuclear capacity began operation in the first four months of 2013. Natural gas and renewable energy will continue to dominate new generation markets for the next 10 years at least. The sun is shining once more on some solar stocks but no more brightly than on SolarCity, another Elon Musk company. SolarCity completed its initial public offering in 2012 and priced at $8 per share. Yesterday, SolarCity closed at $35.69 or up more than four times its initial $8 per share price. Readers of this blog know that I have put a spotlight on SolarCity, as one of the most promising solar companies, because it is solar installation and not solar manufacturing. SolarCity installs solar systems and benefits from the Darwinian competition among solar cell and module manufacturers that drives down the price of the systems that SolarCity sells. Simply put, solar manufacturing is where profit goes to die, but solar system deployment is where profits are made. Over the next 10 years, an enormous amount of solar will be installed across America. The solar installation business will remain high growth, creating thousands of jobs, and the opportunity for profit, if businesses execute well. Researchers at Duke University have published another study on possible impacts of gas drilling on groundwater. This study sampled 127 drinking water wells in Arkansas and found no drilling impact. In Arkansas, the Duke researchers found little methane in the sampled groundwater, and the methane that they did find was not shale gas in nearly all instances, according to isotopic testing. This is good news. In Dimock, Pennsylvania, isotopic testing was also used by the Department of Environmental Protection in 2010. There DEP isotopic testing documented that methane had migrated from gas wells, where mistakes were made, to contaminate 18 water wells. In the press release announcing its Arkansas findings, the Duke team interestingly restates its different findings in Pennsylvania and argues its studies in the two states are not contradictory. Duke suggests different geology in the two states and better industry performance in Arkansas than Pennsylvania explain the differing outcomes. Methane migration is a real problem. Stopping methane from migrating from gas wells as a result of cementing or other problems to water wells must be a top priority for regulators and gas producers. A new study looking at prominent projections about renewable energy made by the International Energy Agency, World Bank, and others confirms that conventional wisdom about renewable energy is wrong! The report observes that "[t]he history of energy scenarios is full of similar projections for renewable energy that proved too low by a factor of 10, or were achieved a decade earlier than expected." For example, the International Energy Agency's 2000 estimate for wind power in 2010 was 34 gigawatts, while the actual level was 200 gigawatts. The World Bank's 1996 estimate for China was 9 gigawatts of wind and 0.5 gigawatts for solar PV by 2020, but by 2011 the country had already achieved 62 gigawatts of wind and 3 gigawatts of PV. In a case of possibly wishful thinking, Exxon in 2012 projected that the world will get just 16% by 2040 of its electricity from renewable energy. I would be glad to bet every member of the Exxon board of directors a Yuengling Lager or two that its strategic planners are way off. By contrast, BP projects that renewable energy will provide 25% of the world's electricity by 2030. I am cautious bettor so I won't place a bet against the BP projection. But I also think it is too low. Why? Projections consistently underestimate global public support for renewable energy, the sharp cost reductions achieved by especially the solar and wind industries, and increasing rates of energy efficiency. Solar in particular is now on a cost and deployment path that will make a mockery of most energy projections authored even in the last two years. And then there is climate. At some point in the next two decades, carbon pricing will become a global reality. At that point, renewable energy, nuclear power, and carbon capture and storage technology will finally have an even playing field, and markets will move rapidly toward these technologies. As the atmospheric concentration of carbon dioxide exceeds 400 parts per million and hurtles quickly toward 500, China is already responsible for about one-third of the world's annual emissions. And Chinese emissions continue to skyrocket, even as emissions stabilize or fall in Europe and the USA. When China's enormous and growing total carbon emissions are noted, as I have just done, a response is often made that China's per capita emissions are lower. In fact, China's per capita emissions in 2011 of 7.2 tons were only slightly lower than the European Union's 7.5 tons and may well be higher by 2013. While China's per capita emissions are today about one-half of US per capita emissions, China will soon have higher per capita emissions than those of New York, Vermont, and California--the three US states with the lowest per capita emissions, as of 2010. Per capita emissions of New York, Vermont, and California were respectively 8.8, 9.7, and 9.9 tons. China's 2011 per capita emission of 7.2 tons are already higher than that of a Washingtonian. Residents of the District of Columbia averaged in 2010 just 5.4 tons. Since 2011 China's emissions have continued to rise sharply, while US emissions have fallen significantly since 2010, as natural gas displaced significant amounts of coal to make electricity. These trend lines make it highly likely that the per capita emissions of China will exceed those of New York and possibly California within the next 5 years. Climate change is a true global problem and the USA, Europe, India, Canada, the Middle East, South America, Australia must address it. But increasingly what happens in China will determine at what level concentrations of carbon dioxide can finally be stabilized. That fact must be faced squarely. When it comes to reducing its carbon footprint, New York has lots about which it can be proud, including the lowest per capita emissions in the country. But New York's reliance on natural gas for daily life is underlined by the fact that it ranks third among all states in portion of its total carbon emissions that come from natural gas. Natural gas accounts for 37.6% of all its carbon emissions. Given its large reliance on natural gas, New York's very low ranking for carbon emissions from coal is not surprising. New York ranks 43rd in total emissions from coal, with 9.1% of its carbon emissions from coal. Unlike many states, New York uses little coal to make electricity but a lot of gas to do so. New York also uses increasing amounts of natural gas to heat buildings. New York is among those states where burning petroleum is the leading cause of carbon emissions. Tim is running out for the gas industry to get gas drilling right in Pennsylvania. Public confidence in the gas industry and its oversight is at tipping points and collapsing. A poll by the University of Michigan and Mullenberg College finds a stunning 58% support "strongly" or "somewhat" a moratorium on gas drilling in Pennsylvania. Just 25% is strongly opposed to a moratorium. The gas industry will note that the poll also finds 49% to 40% support for gas extraction in Pennsylvania. Yet, those numbers are becoming similar to public opinion in New York state and are moving toward a tipping point against gas drilling. So what explains the continuing collapse of public confidence in the oversight and operations of the gas industry itself. Things like only a handful of companies in Pennsylvania embracing the Center For Sustainable Shale Development, while many companies now view it as a threat or annoyance, illustrate the gas industry's self-inflicted wounds. But the biggest reasons for collapsing public confidence include still too many accidents, inadequate regulation and enforcement by the Corbett Administration, and the Corbett Administration's refusal to treat respectfully and fairly drilling complaints and concerns. Add to those blows to confidence the Corbett's nationally unique oppostion to a reasonable drilling tax, and you get these poll numbers. The state of public confidence and opinion reflected in this poll should cause major changes in the gas industry and the Corbett Administration. But it may not change much in either. Time will tell and is running out. Demand for the Prius rose another stunning 49% in the 2012 compared to 2011. During, 2012 1 out of every 33 cars sold in the USA was a Prius. http://www.cnbc.com/id/100661995. Few thought such sales were possible even a few years ago, let alone when the Prius was first introduced now more than 10 years ago, at a time when gasoline cost much less than $2 per gallon. Demand for the Prius and other hybrids undoubtedly surged partly in response to the record high annual average price of gasoline set last year--about $3.70. But the Prius and the Volt (the 6th best selling hybrid) offer more than good gas mileage. The linked to CNBC story has the Top Ten selling hybrids in 2012. Take a look! Unemployment is low, low in North Dakota, consistently below 4%. Oil, gas and agriculture--all have been booming in North Dakota for more than 5 years--are delivering prosperity to its sparse population. While North Dakota has plenty of jobs and needs workers, North Dakota is the most dangerous place to go to work in America and by a lot. In fact, you are about 10 times more likely to die on the job in North Dakota than in New Hampshire. North Dakota's workplace fatality rate is more than 3 times greater than the national average. A stunning 12.4 workers per 100,000 workers die on the job there every year. Just as the oil, gas, and agriculture booms create North Dakota full employment, they also bring real safety challenges that must be addressed every minute workers are on the job. Much more needs to be done to stop workplace tragedies that bring tears and ruin to far too many families. Here is more bad news for Rush Limbaugh and the Wall Street Journal's editorial page who hate electric vehicles. Stock investors are falling head over heels in love with Tesla. After reporting a quarterly profit last week, Tesla's stock price surged another 20% on Thursday and its market value hit a gaudy $9 billion. Not too bad for a company that sold about 5,000 cars in 3 months. As CNBC notes, the second largest auto manufacturer in the world--General Motors--has a market capitalization of $43 billion. By contrast to the millions of cars that GM sells, Tesla expects to sell approximately 21,000 vehicles this year around the world. Stock investors are judging, valuing Tesla as a revolutionary technology company--the first to make a profitable electric vehicle with extended range. Perhaps, today's market judgment will change, but Elon Musk, the founder of Tesla, is fast becoming the most important businessman in the world. What is The Very Worst Fact Among All Of Last Week's Stunningly Bad Climate Facts? As you probably know, the world's most prominent measuring station for atmospheric carbon dioxide concentration recorded on Thursday, May 9th, a daily average value over 400 parts per million. Daily atmospheric measurements of carbon dioxide began first in Hawaii in 1958 and registered 315 ppm then. The news that the world crossed the 400 ppm marker triggered a rush of good reporting about awful facts. Papers around the world noted that the last time earth's atmosphere had 400 ppm was about 4 million years ago, well before the evolution of humans, and when tropical forests covered parts of what is now Canada. The scientific record is robust and tells us all that atmospheric concentrations of carbon dioxide fell to about 180 ppm at the time of the last ice age and remained between 180 ppm and 280 ppm for 800,000 years, until the advent of the industrial revolution. And since humans have been burning large amounts of fossil fuels--coal, oil, and gas--with the industrialization of earth, the atmospheric concentrations of carbon dioxide have been increasing at the fastest rate most likely in the history of the earth. And the rate of increase continues to escalate. That brings us to the very worst climate science fact of the last week full of them. The annual rate of carbon dioxide increase has jumped from 0.7 ppm to 2.1 ppm. We are adding more carbon still faster. Indeed, the increase in just 2012 was a truly terrible 2.6 ppm, according to NOAA data. At that rate of increase, atmospheric carbon concentration will reach 450 ppm in just 19 years. And so, most of those under 50 years old will live on a planet fundamentally transformed, as our climate speeds toward disaster. Wisconsin Nuclear Plant Permanently Shutdown Despite Running Well: Did Gas Shut It? Unlike troubled nuclear plants in California and Florida, the Kewaunee nuclear plant ran well from its first day of operation in 1974 to May 7, 2013, when it was shutdown. For good. The Kewaunee nuclear plant closure is extraordinary or unprecedented, because its cause was neither operating problems, a massive bill for major repairs, or old age. Kewaunee is closing simply because it costs more to run it than it makes in revenue. Economics and the low-prices of the competitive wholesale electricity market shutdown the plant. Is Kewaunee a nuke canary, the first of other nukes shutting down due to economics alone? And did gas shut Kewaunee? Low wholesale electric market prices are a product of gas prices that plunged below $2 in April 2012 before doubling to more than $4 in April 2013, energy efficiency, demand response programs, and surging renweable energy capacity from especially wind. The gas price rebound will firm wholesale markets to a degree, but $4 gas remains at the low-end of the expected price range. Energy efficiency, demand response, and increasing amounts of renewable energy, however, will continue to put downward pressure on wholesale market prices. Kewaunee's small size--just 556 megawatts--and its status as the only Dominion plant in the area that precluded the sharing of common costs with other nukes made the plant particularly vulnerable to the current low-pricing environment. Perhaps, Kewaunee is the weakest of the nuclear fleet and is not a harbinger of more nukes being shutdown by their inability to cover the costs of operating. Yet some data indicate that as much as 25% of the nuclear fleet is nearing the same economic edge over which Kewaunee plunged. Time will tell whether or not Kewaunee is a nuke canary. What are the major causes of water pollution in America? Start with toilets and sewer systems. The Rochelle, Georgia case of raw sewage overflowing for decades the town's sewers and dumping on the yards and in the homes of the African American community spotlights vividly America's under investment in water and sewer systems. While the Rochelle case is particularly egregious, sewage dumping is far from rare. In fact, EPA's stream survey finds that raw sewage in water is one of America's biggest sources of pollution. A full 9% of streams nationally have bacteria levels above safe levels. Pennsylvania has many communities where millions and even billions of gallons of sewage pour into rivers and streams, when rain regularly overwhelms old combined sewer systems. As in Georgia, an overwhelmed sewer system in Pennsylvania can mean sewage backing up and flowing into homes. Santa Claus or the Tooth Fairy cannot stop raw sewage pouring into streams across the Commonwealth and America. Billions of dollars of investment in sewer systems alone can do that. Something in the environment is killing bees. It is not much of an exaggeration to say that bees are a necessity of life, and they are in trouble. That means you should pay attention, at least if you want to keep eating. Prior to 2006, the rate of colony loss for bees during a winter was 10%. Then something started to kill bees. In big numbers! Bee colony collapses averaged 30% from 2006 to 2012. But this past winter was even worse. Don Hopey of the Pittsburgh Post-Gazette reports that the rate of colony collapse hit 50% this winter. Researchers at Penn State University are among the world's leading authorities in trying to pinpoint what is killing bees in massive numbers and save them. That would be good for us, to put it mildly. And by the way, Governor Corbett slashed funding to Penn State University, and those cuts had a particularly devastating impact on PSU's agriculture work. PSU had to lay off and early retire nearly 200 people in Agriculture positions. The Corbett Administration should remember that we reap what we sow. That age of gas that we read so much about is stalled. The press releases trumpeting one more natural gas fueling station are all sound and no real substance. America is hardly rushing to become natural gas powered. Demand for natural gas in 2014 is projected by the EIA to be slightly lower than it was in 2012. Currently, coal is displacing natural gas at power plants in the USA, as coal moves back toward a 40% of the generation market and natural gas falls to about 27%. And the displacement of gasoline and diesel by natural gas is like a drop in the proverbial bucket. It will remain so, unless and until the federal and state government accelerates greatly the fueling infrastructure so that businesses and families can be assured that a CNG vehicle that they buy can be refueled at least within their home state. Last week we learned that Massachusetts met its solar standard a full four years ahead of schedule. Its goal was to install 250 megawatts of solar by 2017 but got that done in early 2013. Now we learn that Hawaii will reach this year its 2015 goal of 15% of its electricity coming from renewable energy resources. Hawaii is deploying huge amounts of solar and significant wind, biomass, and geothermal. In the case of Hawaii, the surge to renewable energy is saving its economy large dollars, as it had been getting 90% of its electricity from burning very expensive oil. Homeowners are paying more than 30 cents per kilowatt-hour for electricity from the grid and solar on a roof slashes the power bill. While Hawaii is a nearly unique case, California and Colorado are examples of two other states that have been able to meet ahead of schedule aggressive renewable energy targets. Why? The costs of renewable energy--especially wind and solar--are falling sharply, and so it is taking less to build more renewable energy. Add public support and the diversity and site flexibility of renewable energy to its radically improving economics and you have a recipe for meeting ahead of schedule renewable energy standards. That's quite a different outcome from what many skeptics of renewable energy expected when these standards were first adopted about ten years ago. Gun murders are down 39% since 1993, according to a new Justice Department report. Crimes with guns are down by an even bigger 70%. Gun murders totaled 11,101 in 2011. That was a decline of 7,152 from the 1993 total of 18,253 in 1993. This is good news, but more work remains to further reduce homicide, suicide, and crime. Corbett Administration & Drilling Advocates Exaggerate Again PA Gas Drilling Jobs--It Is NOT 245,000! Corbett got into his drugs remark pickle, when discussing the Pennsylvania economy and gas drilling. This is a normal pattern for the Governor, who constantly and wrongly suggests that gas drilling alone can bring Pennsylvania prosperity. The 245,000 "jobs" number first appeared in an industry sponsored study more than 2 years ago that actually counted the number of "hires." Jobs and hires are different categories. Each new job normally creates more than 1 hire, as people leave a job and a new person is hired to fill that job. Despite the obvious inaccuracy in the 245,000 number, the Corbett Administration and others in the drill-baby-drill camp keep using it. These folks need to get a clue. This continual exaggeration only undermines their credibility. If you have one of the approximately 100,000 jobs created directly and indirectly by gas drilling, it is the only one that counts. And those jobs are concentrated in rural counties, where the unemployment rate has fallen as a result of gas drilling. But 100,000 jobs are less than 2% of the 6.5 million jobs Pennsylvania needs. Gas drilling alone cannot bring broad prosperity to Pennsylvania. No one industry can do that. Pennsylvania needs a Governor who understands these basic facts, or Pennsylvania will remain at the bottom of job creation tables. You can add 2012 to the list of hot years, as the climate hoax grows. All the years from 2001 to 2012 are among the 13 hottest since 1860 when the records kept by the World Meteorological Organization began. And the last 27 years, going back to 1983, have all been hotter than the average for the period 1961 to 1990. Temperatures are up. The climate has already changed. In 1990, the world essentially used no wind or solar energy, and considerably fewer nuclear reactors were operating then compared to now. Today, the world has more than 100,000 megawatts of solar power and nearly 300,000 megawatts of wind--big numbers and a lot of power production. Over the last 20 years, the boom of carbon-free energy around the world is extraordinary. Though renewable energy especially has boomed, coal has done extraordinarily well too. Led by China's unquenchable thirst for energy and especially coal, the world is using more coal today than ever before. Among the recommendations of the IEA to reduce carbon pollution is to use more gas and less coal, while accelerating the deployment of renewable energy and nuclear power. Three great strengths of renewable energy is its diverse fuel sources and technologies; its ready ability to scale from small to big; and its suitability for generating power on-site and for feeding the grid. Vermont's cow power--the use of manure in anaerobic digesters to make electricity--has been successfully producing enough power for the equivalent of 2,200 homes. And it is now expanding. Vermont's cow power is just one example of the ingenuity and commitment to sustainable technologies that keeps Vermont's economy doing as well or often better than the nation as a whole. Fun Question Of The Day: Is PA 49th Or 50th In Job Creation? Headlines around Pennsylvania have told a sad tale--Pennsylvania ranks 49th in job creation from March 2012 to March 2013. But, in fact, the news is sadder still. As John Baer wrote in an excellent column, Pennsylvania ranks 50th in job creation if seasonally adjusted data is used. And so stories criticizing Corbett for ranking 49th in job creation (they and others used the Arizona State University Index that employs non-seasonally adjusted data) did not exaggerate Governor Corbett's poor performance. Indeed, it would be more accurate to say that Pennsylvania ranked 50th or dead last and lost 6,000 jobs from March 2012 to March 2013. Now we can add to the Governor's misunderstanding of the Pennsylvania economy the rate and trend of drug usage among Pennsylvanians seeking jobs. Robert Vickers of the Harrisburg Patriot News first noted that just 3.5% of those seeking jobs who take a drug test fail it. Sean Kitchen then pointed out that the rate of failed tests has been falling slightly since 2007. The facts show that Pennsylvania is at the bottom of job creation over the last 12 months, that gas drilling alone will never create enough jobs to meet Pennsylvania's need for 6.5 million, and that 96.5% of job applicants pass drug tests. Governor Corbett is uniquely ill-informed, and he at least should stop scapegoating and slandering those seeking jobs in an economy that he has made tougher not better. With its Friday, April 19th posting noting that Pennsylvania's economy ranked 50th in jobs creation for the period March 2012 to March 2013, this blog triggered a cascade of stories that went viral when Governor Corbett tried to excuse Pennsylvania's jobs performance by discussing drug usage among job applicants. As John Baer wrote in an excellent column, Pennsylvania actually ranks 50th in job creation if seasonally adjusted data is used, but 49th if non-seasonally adjusted data are the numbers crunched to rank states. Baer also correctly stated that Pennsylvania lost 6,000 jobs from March 2012 to March 2013, if the seasonally adjusted data are used. And so stories criticizing Corbett for ranking 49th in job creation (they and others used the Arizona State University Index that employs non-seasonally adjusted data) did not exaggerate Governor Corbett's poor performance. Indeed, it would be more accurate to say that Pennsylvania ranked 50th or dead last and lost 6,000 jobs from March 2012 to March 2013. My only quibble with the Baer piece is its omission that most of the jobs created during the 28 months of Corbett's term came in his first 12 months. Many of the jobs created on Corbett's watch are the fruit of Governor Rendell's last year in office, when Pennsylvania ranked 7th in jobs' creation during 2010. At this point, the failed policies of Governor Corbett are strangling job creation in the Commonwealth. Mark Price of the Keystone Research Center also has an excellent piece on Pennsylvania's jobs performance that broadens analysis. Price finds, if you don't just rank the states by comparing March 2012 to March 2013, but rank them on the basis of jobs created in all 12 months from March 2012 to March 2013, Pennsylvania ranks 45th. All facts and data slices are ugly now. Given Pennsylvania's lousy jobs growth, Andrew Maykuth of the Philadelphia Inquirer suggests accurately that gas drilling will never create enough jobs for broad prosperity in Pennsylvania. Unfortunately, the gas industry feeds misunderstanding of its important economic role, when it states that gas drilling is responsible for 240,000 jobs. It has not. In the Maykuth piece, the industry again equates "hires" with "jobs." One job generates many hires, as the job turns over, and another is hired to fill it. Gas drilling in Pennsylvania generates about 100,000 direct and indirect jobs. If you have one of those jobs, it is the only one that counts. And those jobs are concentrated in rural counties, where the unemployment rate has fallen as a result of gas drilling. But 100,000 jobs are less than 2% of the 6.5 million jobs Pennsylvania needs. Gas drilling alone cannot bring broad prosperity to Pennsylvania. No one industry can do that. Now we can add to the Governor's misunderstanding of the Pennsylvania economy the rate and trend of drug usage among Pennsylvanians seeking jobs. Robert Vickers of the Harrisburg Patriot News first wrote that only 3.5% of those applying for a job who take a drug test fail it. Sean Kitchen then pointed out that the rate of failed tests has been falling slightly since 2007. The facts show that Pennsylvania is at the bottom of job creation over the last 12 months, that gas drilling alone will never create enough jobs to meet Pennsylvania's need for 6.5 million, and that 96.5% of job applicants pass drug tests. Governor Corbett is uniquely ill-informed and should stop scapegoating and slandering those seeking jobs in an economy that he has made tougher not better. There are many dangerous jobs. The terrible tragedy in West, Texas, where 12 firemen died rushing to a factory that was poorly run and poorly regulated drives that point home. A new Centers For Disease Control And Prevention study finds that oil and gas workers do dangerous work. Indeed, they have a fatality rate that is 7 times greater than the national average. Oil and gas workers suffer 27.1 fatalities per 100,000 workers, while the US average is 3.8 fatalities, and many of the deaths are in helicopters. http://www.cdc.gov/mmwr/preview/mmwrhtml/mm6216a2.htm. The helicopter accidents took place mainly in the offshore industry, but it is not helicopters alone making oil and gas work dangerous. The fatality rate would still be about 4 times greater for oil and gas, even with the helicopter deaths removed from the oil and gas total. Either way, the record is just not safe enough. Massachusetts is going big on solar. It announced that it had reached its 250 MW goal a full four years early. Though Massachusetts achieved its 2017 solar goal early, it is not finished. Massachusetts' new solar goal is 1,600 MW by 2020. The substantial business activity in solar led to a 28% decline in solar prices in 2012 and solar is a major part of Massachusetts clean energy economy that features 5,000 firms and 71,000 jobs. Massachusetts clean energy jobs grew 11.2% from 2011 to 2012, about a 6-times faster rate than the national job growth rate. Meanwhile, in Pennsylvania, we have a state government hostile or neglectful to renewable energy and energy efficiency, and that's one reason why Pennsylvania lost 5,000 jobs in the last 12 months. The Longer Corbett Serves The Worse Pennsylvania's Jobs Performance Gets: Read These Facts And Weep! The longer Governor Corbett serves the worse Pennsylvania's jobs performance gets. Don't believe it? Here are the facts. Nearly all of the jobs created in Pennsylvania during Corbett's term were done so from January 2011 to March 2012. Since March, 2012, a new-jobs famine struck Pennsylvania. In fact, over the last 12 months, Pennsylvania has lost more than 5,000 jobs. The specific numbers taken from Table 5 of the Bureau of Labor Statistics Regional and State Monthly jobs reports show that Pennsylvania had 5.646 million jobs in January 2011, when Governor Corbett took office. By March, 2012, Pennsylvania had 5.748 million jobs or 102,000 more than when the Governor was inaugurated. Yet, by March 2013, Pennsylvania had 5.742 million jobs or more than 5,000 less than it had a year earlier. In the first year of Governor Corbett's term, Corbett benefited from a growing national economy and the strong jobs creation momentum that Governor Rendell gave to him. Pennsylvania ranked 7th in jobs creation in 2010, the last year of Rendell's term. It is time for all Pennsylvanians--labor, business, workers, investors--to face the fact that Governor Corbett's policies have crippled Pennsylvania's economy. There is absolutely no excuse--drugs or anything else--for the terrible performance of our economy that is crushing the dreams and hopes of Pennsylvanians. It is amusing to watch some prominent business association leaders like Gene Barr of the Pennsylvania Chamber of Business and Industry and David Taylor of the Pennsylvania Manufacturers Association rush to defend Governor Corbett on his jobs record and drug remarks. These gentleman who are strong supporters, even architects, of Governor Corbett's failed economic policies want us to believe that Pennsylvania's job struggles are because workers in the Commonwealth cannot pass drug tests. Really? If drugs are THE jobs problem, why is this scourge not affecting job creation in California, Texas, New York, and all the other states that collectively created nearly 2 million jobs in America from March 2012 to March 2013? Is the drug scourge so much worse in Pennsylvania that it explains why Pennsylvania lost 5,000 jobs in the last year? Do Barr and Taylor really want to suggest that the drug problem is so especially bad in Pennsylvania that it is uniquely crippling our economy here? That Big Bong theory for Pennsylvania's economy is nonsense. The leaders of the Pennsylvania Chamber and the Pennsylvania Manufacturers Association do not serve their membership well when they act as Republican front organizations first and economic development groups second. They do, indeed, have the ear of the Governor and should tell him the simple truth that Pennsylvania's economy lost jobs in the last 12 months, even as the nation created about 2 million. The truth is that Corbett's governorship is a train wreck for Pennsylvania. Verizon's sustainability executive says on-site generation both cuts carbon emissions and increases reliability. He points out that a Verizon facility with fuel cells remained operational during and after Sandy, even as the grid collapsed around it. Verizon states that the first step is to build more on-site generation to run "parallel" with the grid, but Verizon is thinking about cutting the chord to the grid for some facilities. Verizon's on-site power generation will initially produce 70 million kilowatt-hours per year or enough power for 7,000 homes. Make no mistake about it. Full independence from the grid and central power stations is where the distributed power generation revolution is headed in about another decade. Gas production operational excellence is hard. No doubt about that. It requires constant attention and total commitment from the top of a drilling company down to all those with whom it contracts. Moreover, handling and containing fluids at the surface remains a true test of whether a company achieves operational excellence. Two major frack fluid spells in the past 6 weeks in Pennsylvania show surface spills remain a major source of environmental impact from gas production and the imperative need for excellence. The first spill of 220,000 gallons caused the temporary evacuation of 3 families and this week's spill of 9,000 gallons put frack fluid in the basement of a neighbor's home and onto their horse farm. Also, frack fluid spilt at the surface that breaks containment does not stay at the surface but seeps into soil and eventually groundwater. When frack fluids are still ending up in the basements of Pennsylvanians, preventing and containing all spills at the surface plainly needs even more attention from regulators and every company in the industry. This real problem would also be a good focus for the new Center For Sustainable Shale Development. Governor Corbett's explanation for why Pennsylvania has lost jobs over the last 12 months has been described by the Philly Daily News as the "Big Bong Theory." Corbett believes those without work, working part-time, or looking for a better job are not having success because of failed drug tests. The real problem of course is not drug tests, but not enough jobs. Andy why has Pennsylvania produced no jobs, when the nation created 2 million? Corbett is under the influence of Tea Party and Norquist ideas. The jobs performance of the Corbett Administration gets worse the longer he serves. Indeed, most of the jobs Pennsylvania has created during his term were in his first 12 months. The power market share spread between gas and coal last year narrowed remarkably, falling to just 7%, as the shale gas supplies crashed the price of gas and made it a ferocious competitor to coal. And so coal last year had its worse year in power generation markets in decades. It provided just 37% of America's power. Coal's bad year was gas's great year, as gas grabbed market share and generated 30% of the nation's electricity. Indeed, in April of 2012, coal and gas provided almost equal amounts of our electric power, an extraordinary event in power markets. It should be noted that as recently as 2000, coal accounted for about 52% of our electricity and gas just 16%. But gas above $3.50 per thousand cubic feet is changing the fortunes of gas and coal in 2013. In the first two months of 2013, coal surged up and provided 40% of our power, while gas sank to 26%. Down to just 7% in 2012, the market share spread of gas and coal doubled to 14% in the first two months of this year. Coal's reign as the King of the power markets is more secure this year and may well not be challenged again seriously until 2015 at the earliest, when the EPA's Air Toxic rule takes effect. The Koch Brothers are at war with the wind industry, using their massive wealth to finance a coordinated attack on wind farms from sea to shining sea. But 2012 was the Koch brothers wind Waterloo. Though headquartered in Kansas, the Kochs could not stop the wind boom even in there Deep Red backyard. Kansas ranked third in new wind capacity in 2012, adding an incredible 1,447 megawatts. Wind found also found a warm embrace yet again in the red states of Texas and Oklahoma that ranked 2nd and 4th in new wind capacity. Which state ranked 1st? The biggest blue state of them all--California that installed 1,795 megawatts of new wind capacity just in 2012. When it comes to wind, there really are no blue states and no red states--just the United States of America!